Total Quality Music helps create a magical, positive atmosphere for your wedding day. Your wedding guests will enjoy music that flows effortlessly from one activity to the next. 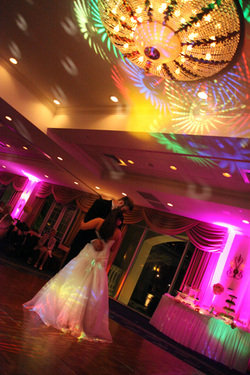 The most romantic, intimate point of the reception is typically during your first dance. Here we play your favorite love song. After your special dance, the parents are invited to the dance floor to dance with if you so choose, followed by the wedding party and the wedding guests. During dancing, the music is presented in sets of three to four songs with transition activities in between. This keeps the reception flowing, interesting and appealing to different tastes. Sets can include oldies, swing, disco, country, Top 40, hip hop, Latin, Dance music etc. Between sets, we transition with activities such as: Bouquet and Garter, Money Dance, Cake Cutting, Line Dances, and Special Requests. Transitions and sets work well together to create a positive, enjoyable atmosphere that appeals to the diverse nature of your guests. Total Quality Music is conscientious of the audience's mood at all times. We are flexible with requests and activities, and can adapt the music if necessary. It is our goal that you and your guests have an uplifting and enchanting experience. You want your guests to remember your event as enjoyable and fun. Total Quality Music wants you to be completely satisfied with the entertainment services, so prior to the event we sit down with you to discuss the program. As your guests dine, we play light and unobtrusive music so they can engage in conversation and mingle. Following the meal, we transition toward a more lively program. We employ a variety of audience participation techniques if you desire, all in a non-pressure atmosphere. These activities can include dance instruction, group dances, line dances, live vocals and special requests.